Common Names: speck, speckles, slab (large fish), google eye. 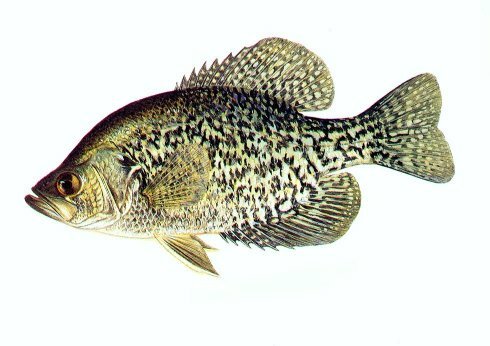 Habitat: There are two species of crappies, the Black Crappie, Pomoxis nigromaculatus and the White Crappie, Pomoxis annularis. They are found in almost all waters with the exception of mountain streams. They are more abundant in large impoundments, natural lakes and backwaters. White crappies are more tolerant of turbid conditions with the black crappie preferring clearer lakes. Crappie are found in almost all warm waters of the state, but are more abundant in large impoundments, natural lakes and backwaters. White crappies are more common in large reservoirs and tend to be more tolerant of turbid conditions. Black Crappie tend to dominate in clear water habitats that have large amounts of submerged vegetation. Food Habitats: Young Crappie feed on invertebrates such as water fleas and insects. At about 7 inches, fish become more prevalent in the diet. In large impoundments, adult crappie feed on threadfin shad and small gizzard shad throughout the year, however, they will feed extensively on mayflys during the summer months. Spawning: As water temperatures approach 60°F, the male crappie will prepare a nest by fanning out a shallow depression on top of sand, gravel, or mud in from two to eight feet of water. Nests range from 8" to 15" in diameter and are usually found in colonies, with as many as 30 nests found in a 9-square yard area. Females deposit from 3,000 to 15,000 eggs per spawn, but may spawn with several different males. Large females have the potential to lay up to 150,000 eggs. The fertilized eggs are guarded by the male until hatching after 2 to 3 days and guarding continues for an additional 3 to 4 days until fry leave the nest. Miscellaneous: The black crappie is very similar to the white crappie, differing only in some body characteristics, color patterns and slight habitat preference. In most impoundments, one species or the other will predominate. The crappie is one of the most popular sport fish in North Carolina. It is relatively easy to locate and catch and it has a very good flavor. Crappies are often found in large numbers around piers and brush. These loose aggregations are not really schools of fish but they can appear to come and go as they are fished out of a small area. Crappie are relatively short lived and their populations can fluctuate widely from year to year. Crappie populations tend to decline as a reservoir ages. However, habitat management has the potential to significantly improve crappie populations.